One of Britain's biggest rail operators Connex is to lose its franchise to run services in Kent and Sussex. The regulator the Strategic Rail Authority said poor financial management was to blame. 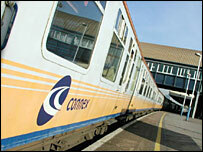 The Connex South Eastern franchise had been due to run until 2006, but will now cease at the end of the year. Connex expressed shock at the "unexpected" decision. "Whilst we acknowledge the SRA's decision, we strongly disagree with the reasons behind it. We are considering all our options, " said chief executive Olivier Brousse. An interim company will run the existing services from December while a new private operator is found - expected within 12 to 18 months. Both Connex and the SRA, which oversees railways on behalf of the government, insisted services would not be affected. "I assure our passengers that we will work very hard, until the last minute, to run the best service we can," Mr Brousse said. About one in five Connex South Eastern trains run late, according to the most recent punctuality figures. But the SRA said it was the overall financial management of the franchise, rather than its "operational competence", which was causing concern. The SRA gave Connex £58m of public money last December to keep the company running, on the proviso that it improved its financial performance. But the operator recently requested another £200m in subsidy. "This is not a question of the operational competence of Connex, but there has been a serious loss of confidence that we have in the ability of the company to run the business in its widest sense," SRA chairman Richard Bowker told the BBC. "We set Connex some very serious and very tough targets last year. They have not met those and we decided to take some very firm and decisive action." Commuters were critical of the current service and pessimistic that improvements would be made. "If they get better and we get a better service, that's great news, but I'll believe it when I see it," said Dave Regan, 43, from Bexley. Solange Vennink, 43, from Rainham in Kent, said: "I doubt if it will ever improve. I've written to them with so many complaints. "But I think the only thing they have tried to mend is the air conditioning. They certainly haven't improved the service." Connex can still bid for other franchises, as Mr Bowker said the decision was specifically about southeast services. It has expressed an interest in running the Trans-Pennine Express and trains in Wales. Passenger groups and politicians gave a cautious welcome to the SRA's action, questioning whether performance would be any better in the future. Liberal Democrat transport spokesman Tom Brake said the move was a "clear signal" to other train companies about the standards required, but wondered whether the SRA had "sufficient experienced managers" to turn the franchise around. The Rail Passengers Council said: "It is good to see the SRA is not prepared to bail out Connex further and is taking decisive action" - but added that the interim company would be watched carefully. Bob Crow, general secretary of the biggest rail union the RMT, said the SRA should have gone further. "Here is further proof of the crisis of privatisation," he said. "Here is an opportunity to begin bringing train operations back into the public sector where they belong. If Connex is unfit to run its franchise, why leave it in the company's hands for another six months?" ASLEF, the union for train drivers and operators, said passengers face "a run down service for the rest of the year and for the industry as a whole." General secretary Mick Rix said: "What is the point in handing £56 million of tax payers money to Connex and then snatching the franchise away only just a few months later, only to hand it to another group of fat cats?" "The company is being removed from its franchise three years early"